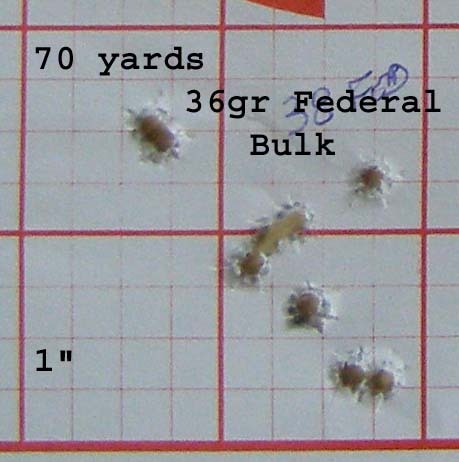 I was having issues with the accuracy of my old Ruger 10/22 carbine (10-shot groups as large as 3" at 50 yards). gelandangan, suggested I slug the barrel. I learned that the barrel was far from uniform and probably worn or not the best of quality. Lucky me, my wife got me a stainless flute Shooter's Ridge Barrel for Christmas! I got a Stocky's Eliminator Stock for it a week ago and got it out to the range yesterday. Group size was greatly improved (just over 1.5" at 70 yards) but not what I would expect is this barrel's potential. The stock needs some work. It has a longer reach for the trigger that some grip shaping will help. I also need to bed the action and free float the barrel before I should assess accuracy potential. I also ran into a couple other issues. I modified the bolt hold-back so it would release when the bolt was drawn back. That mod did not work but now it activates after 3 or 4 shots. Also, I used a Leupold 3-9 VX-II scope I have as a spare. It bottomed out in elevation before I could zero the impact. Must be a scope issue because I remember it ran out of elevation on my .308 also. May have to send it back to the factory. Ah, yes, more projects to make me happy as a clam. Slim as far as I'm concerned that's darned good for a 22 and it sounds like you can sqeak out some more accuracy from there. Maybe you can shim the scope to get back to a more centered adjustment? I've had to do that a few times. Brownell's and Midway both carry scope shims but you can make some- I just use some electrical tape folded. If you can't shim the base you can shim the rings. Fine looking stock!! Nice looking barrel too. Did you get the new V block to mount it? Man I wouldnt have picked that for a 10/22! It sure looks different keep us posted on progress. roll your scope carefully on a flat surface to see if it maybe is a wee tad bent.I have seen this on a nikko I had. my 3x9x40 v11 leopold wouldnt shift vertically at all when I first got it but a large adjustment or 6 freed it up it was sticking in place it is fine now. Man I wouldnt have picked that for a 10/22! It sure looks different. Elvis, what would you have picked? What do you find looks different? There are some radical thumb-hole stocks out there and I thought this was more conventional. This laminent patter is called Timber and I thought it would be a good combination if I went hunting with it unlike many of the flasher colored ones. Maybe you can shim the scope to get back to a more centered adjustment? Before I blame the scope (even though its done this on two rifles which didn't have issues with other scopes), I will take this Leupold off and mount it on my AR which I have swapped multiple scopes out on and have not had a problem with crosshairs being limited. That should tell me if its the scope or the mount. I will probably pick up a beefier rail mount anyway at the next gun show. Im buggered if I know what I would have picked there are so many different options out there now. dont get me wrong I think it looks just fine n dandy those multicoloured laminated stocks are just the pussycats pajamas. Aloys, I'll do that next time out. Be sure to try several types of ammo before investing too much time and energy into something that may not need fixing. .22 LRs are probably the most finicky rifles there are for liking or disliking various types of ammo. I have a couple that just love the "cheapy" Widcats and Lightnings but spray T-22 and Eleys all over the backstop. Be sure to try several types of ammo before investing too much time and energy into something that may not need fixing. SingleShotLover, I have a large quantity of 22LR to shot up but will have to get some subsonic match ammo to round out the selection. still think I want to bed the action before I go out again. I also have to take care of the bolt hold-back. Modifying it to release when the bolt is drawn back didn't work so I may just have to buy another stock part. It was a simple mod but didn't work out. This gun will be a lot of fun! I had a thought on something you might want to watch for during your ammo trials. A friend of mine had a Butler Creek bull barrel on his 10/22 that would blow out the rim using Remington HV ammo. This would happen about every fourth or fifth shot and would send tiny slivers of brass out of the action. When we looked into the matter it appeared as though both the case and the bullet profile were just a tiny bit longer than anything else either of us had on hand. Coupled with his barrel having a so called "match" chamber of minimum dimensions (as does my Adams and Bennett which has never had this problem) this appeared to cause either the bullet or the case (or maybe both) to be slightly jammed into either the chamber or the lands, which would of course raise pressure. Since I didn't have reamers, he took the barrel to a gunsmith friend of his who cured the problem with a couple twists of a finish chambering reamer and lengthening the throat by a couple thousandths of an inch. I think the whole thing cost him $10. He could have just as easily changed ammunition, but he had a huge supply that he really wanted to shoot. This is the only incident I have heard of this happening, but thought you might want to watch for it in your quest. As Suz says Slim...that's pretty reasonable accuracy out of a .22 rimfire mate...but I reckon there is potential for a little better accuracy in there. I have always found slightly better accuracy from the slower .22 rimfire rounds mate. Probably the best accuracy I ever got was from Remington Sub Sonics...a fraction over a 1/4" 10 shot hole at 25 metres. Have a scout around for some standard velocity or standard LR rounds mate...its worth the trouble. I have always found slightly better accuracy from the slower .22 rimfire rounds mate. Keeping the bullet subsonic is a plus put I often find they don't have enough energy to operate the action. I'll get some Remington Target/Ely for the next go.